A Step-by-Step Approach (English/Spanish Language Edition). By Eric Marienthal. Method/Instruction; Woodwind - Saxophone DVD. Alfred's Artist Series. Instructional and Jazz. Instructional video: DVD. Alfred Music #00-25450. Published by Alfred Music (AP.25450). ISBN 0739040324. 9x12 inches. English. 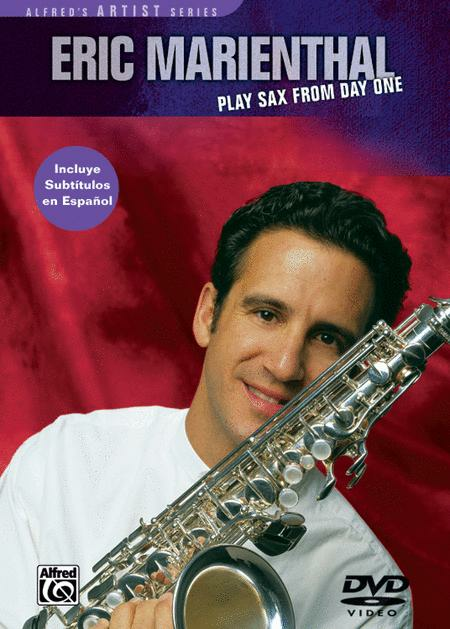 Eric Marienthal is one of the most in-demand and influential saxophone players in music today. His distinctive voie and incredible techniques have made him the choice saxophonist of countless headlining artists. In addition to being a first-call L.A. studio musician, Eric has performed and recorded with some of the greatest names in jazz, including the Chick Corea Elektrik Band, John Patitucci, David Benoit, David Gresin, Gordon Goodwin's Big Phat Band, Lee Rittenour, Dave Weckl, and the Rippingtons. 'Play Sax from Day One' is a complete introduction to the saxophone. In his clear and easy-to-follow style, Eric will teach you everything you need to know to get started playing the sax.Lessons include an introduction to each of the saxes, putting the instrument together, fingerings, tone production, tonguing, scales, daily practice routines, and even a section that lets you play along with Eric. This beautifully shot DVD contains a complete lesson that will have any any beginner playing music in no time.